Jan. 24 — It has now been more than a month since Steelworkers Local 8751, the Boston School Bus Drivers’ union, won a major victory against the transnational monster Transdev/Veolia and the austerity-minded city administration that employs them. This company, which illegally fired four key union leaders in 2013 and was taking a hard line in contract negotiations, was forced by the militant rank and file to rehire President Andre Francois, Vice President Steve Kirschbaum, Financial Secretary Steve Gillis and Grievance Chair Garry Murchison. Local 8751 also won a great contract for the members. Indications are, however, that the fighting spirit that brought the four leaders back to work will prevail and that the workers will see the retro pay in their checks before the end of January. They have already won other victories, such as the reinstatement of an unjustly fired union veteran in the first arbitration struggle since the four’s return. 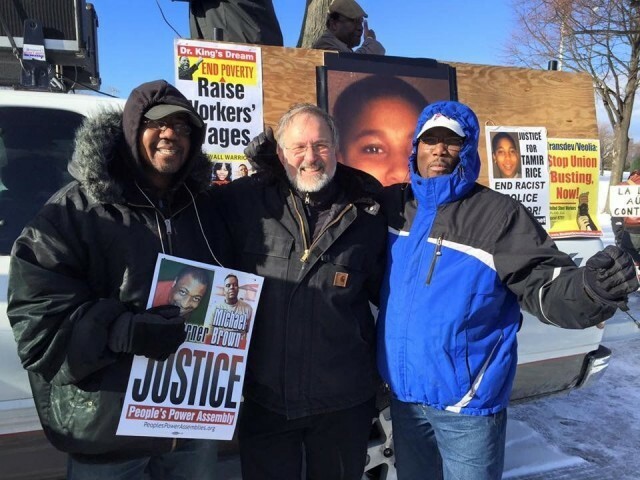 Some of Local 8751’s Team Solidarity attended MLK Day actions in Boston. From left, Claude St. Germain, Stevan Kirschbaum, Fred Floreal. The victory has not given the union a moment’s rest. According to Gillis, “Getting back to work has been an equally difficult job as winning our jobs back! We got back into the swing of things with a major yard rally, complete with picket signs, bullhorns and special guest speakers organizing for the Martin Luther King day march.” The January 18 march, organized by Massachusetts Action Against Police Brutality, combined community demands of “Jail killer cops” and “No to Islamophobia” with issues of young workers from the Service Employees union who marched into a KFC restaurant and a Burger King parking lot to demand “$15 and a Union” and the rehiring of fired co-workers. Living Dr. King’s dream is Local 8751’s legacy, from its founding during the violent racist campaign aimed at stopping school desegregation in 1974 to its solidarity action on MLK Day in 2012, which helped stop the closing of the Grove Hall post office that provides critical service to the Black community. Now bus drivers are getting ready to jump into the fight against $50 million in austerity cuts proposed by Boston Public Schools and the expansion of charter schools. 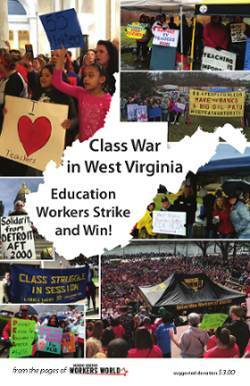 In the coming months the four union leaderes will share their story at the Southern Workers’ Assembly School in North Carolina March 4-6, the Appalachian Workers’ Alliance conference in West Virginia, the Labor Notes conference in Chicago April 1-3 and other gatherings around the country. The victory was written up in Avante, the organ of the Portuguese Communist Party.